18 months & up. Easy on, easy to clean soft vinyl smock features hook and loop closures, pocket and long sleeves to keep the mess away from clothes. Set of 4. 18 months & up. 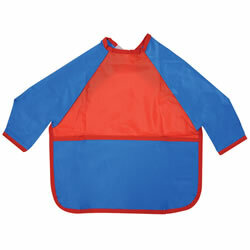 Easy on, easy to clean soft vinyl smock features hook and loop closures, pocket and long sleeves to keep the mess away from clothes. 2 years & up. 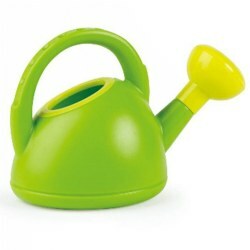 An easy-to-tote watering can is the perfect prop for budding gardeners. Colors may vary. 10 months & up. 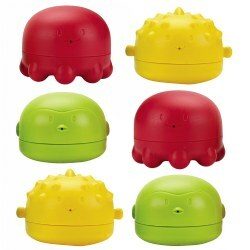 Cute faces with features children will love to squeeze. 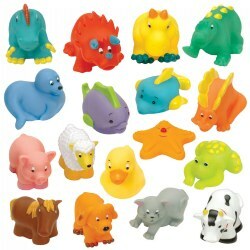 Set of 17 includes dinosaurs, sea life, and farm animals. 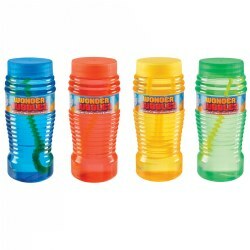 They are great in a block area or for water play. Perfect size for small hands! 12 months & up. 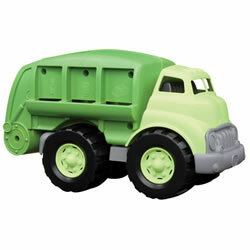 Tough and durable, this recycling truck is 100% made from recycled milk cartons. The eco design features a workable dumper and no metal axles to rust. 12 1/2"L x 7 1/4"H. Made in the USA. 10 months & up. Small in size but perfect for the youngest toddler! 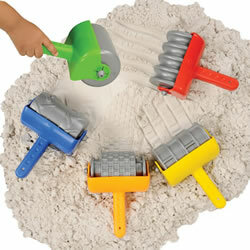 This set of four soft plastic mini buckets includes four plastic scoops and four plastic rakes in assorted colors. Bucket measures 4" tall and rake measures 5 1/8" long. 1 year & up. 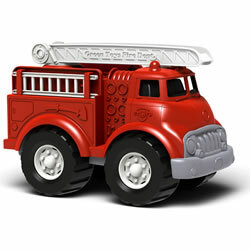 Solidly constructed from 100% recycled plastic milk containers, this fire truck features a sturdy roof ladder that pivots vertically and rotates 360 degrees, two removable ladders and no metal axles. 10 1/2"L x 6 1/4" W x 7 1/2"H.
18 months & up. Durable for the toughest construction job, this set of 5 textured rollers feature easy grip handles and a 5" rolling surface. Children will have fun creating designs, road and patterns in the sand. The all plastic roller can also be used with paint. Color of handle may vary. 7"L x 5"W. Set of 5. 3 years & up. 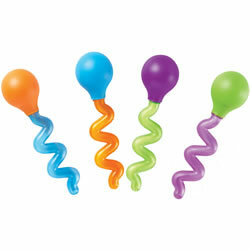 These fantastic outdoor bubble wands entertain children for hours with their unique and pretty shapes. 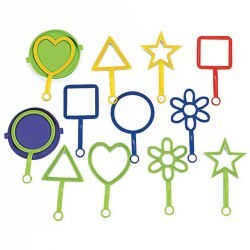 This set includes bubble wands in heart, star, flower, circle, square and triangle shapes. Includes two 5 1/2" trays and twelve 8" wands. Made of plastic. Bubble solution is sold separately. 10 months & up. 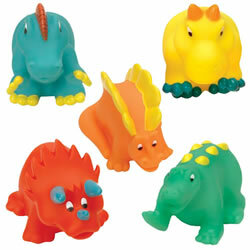 Five colorful dinosaurs are soft and squeezable. They are great in a block area or for water play. All have cute faces and features that children will adore. Perfect size for small hands. Approximately 4"L x 2 3/4"H. Also includes a clear vinyl storage bag. Colors may vary. 6 months & up. This school of fish link together or stack on top of each other. Different sieve designs decorate the bottom of each fish. The smallest fish comes with a twirling center. Use with sand or water. 18 months & up. 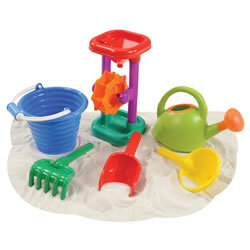 A small set with essentials for sand and water fun. Includes shovel, rake, watering can, scoop®, water wheel, and bucket. Please note: Kit components may change due to availability. We will substitute developmentally appropriate items for the purpose for which they were intended. 4 months & up. 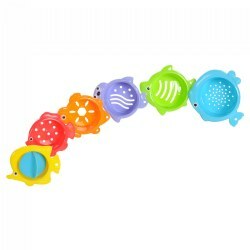 Sized right for toddler water tables, these plastic bubbles rattle with their unique play patterns and twirl, bobble, and spin as they float on the water. Assortment may vary. 2 years & up. Silly-looking eyedroppers and safe for toddlers! 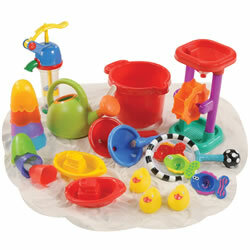 Perfect for experiencing cause and effect and fine motor development in the water table or discovery area. 2 years & up. Scoop®, dig, pour and more! 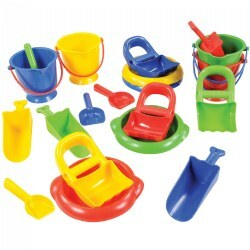 Rugged plastic sand set includes a total of 20 pieces - four 7" high buckets with handles, and four each: shovels, hand diggers, scoops with handles, and large sieves. Pieces and colors may vary from those shown. 2 years & up. 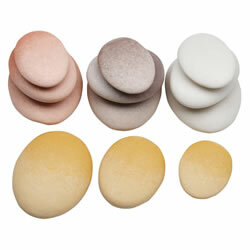 Smooth to the touch, this set of 12 realistic stones come in 3 sizes and 4 colors. 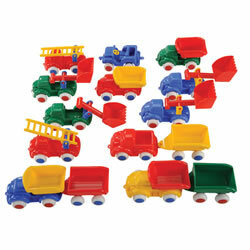 The chunky size is perfect for toddlers.They can be used for sorting activities and stacking. The soft touch makes them perfect for sensory experiences. 6 months & up. 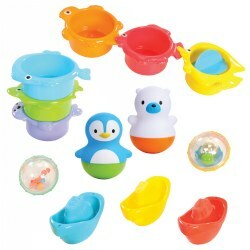 Children will enjoy water play with these fun items that entice little ones to explore straining, floating, scoop® and pour, and seeing if they can make items sink. Kit contents may vary. 12 months & up. Imaginations race faster than these cars. Children will love these easy to grip vehicles. Set includes a jeep, a racecar, a car, a truck, 2 tractors, 2 fire trucks, 2 diggers, 4 dump trucks, and 4 wagons. Approximately 5"L.
2 years & up. Poles feature magnetic red and white bobbers that attract the characters. Characters are air-tight, helping to limit mold and mildew. 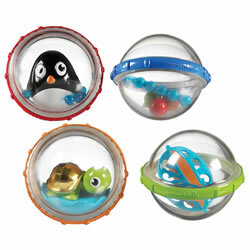 Magnetic bobbers and characters help develop hand-eye coordination. The reels make a fun clicking sound when turned, giving it a more realistic feel. 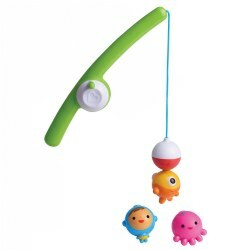 Set includes: 2 fishing poles with bobbers and 6 magnetic characters. 2 years & up. 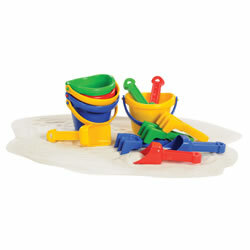 Children will practice cooperative play and sharing while learning introductory STEM skills in this fun water play set. In addition to learning the basics of counting and science concepts, children build upon their hand-eye coordination while using fine motor skills to scoop®, pour, and pump. Items may vary. 2 years & up. Time flies when you play with this fun toy! 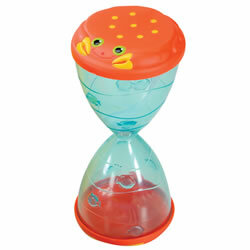 Lid comes off to fill and refill the hourglass with sand or water. 18 months & up. When a big job is needed, call in this heavy duty working vehicle! 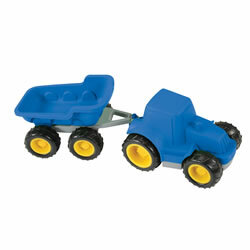 Durable plastic body along with silent wheels makes for perfect indoor or outdoor play. The wheels leave real tracks in the sand. A perfect addition to farm themed block play. Colors may vary. These colorful bottles contain 4 ounces of bubble solution and a bubble wand. Comes in assorted colors. Colors will vary.